A 20-year-old female patient presented to the Department of Ophthalmology due to gradually progressive left-sided retro-orbital pain associated with headache for 6 months. There was no facial asymmetry and ophthalmological examination revealed no diplopia or proptosis or dimness of vision [Figure 1]. Visual acuity was 6/6 in both eyes. A normal visual field measuring 90° temporally, 50° superiorly and nasally, and 60° inferiorly was noted in both eyes. Fundus examination showed no abnormalities in either eye. Pupillary response to direct and consensual light was normal in both eyes. There were no findings after the anterior rhinoscopic examination performed on the patient. During the endoscopic nasal examination, a nontender mass with a hard consistence and a smooth surface medializing the left middle concha was noted. 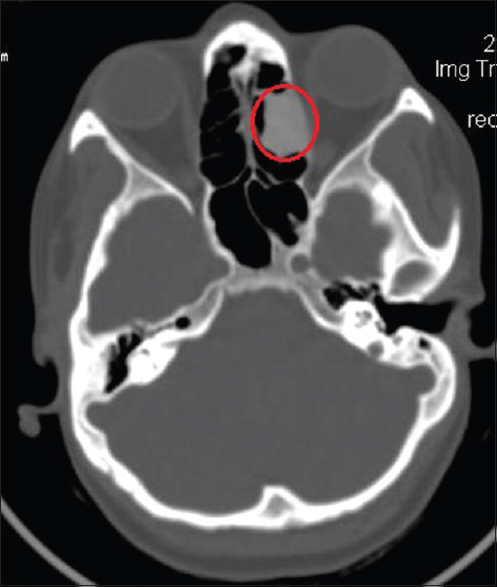 On the paranasal computed tomography scan, a lobular mass-sized approximately 2.4 cm × 1.6 cm × 2.4 cm (AP × ML × CC) with the same density as the bone tissue was observed which covered the left orbital plate of ethmoid and ethmoid air cells, extending medially to the septum and laterally to the lamina papyracea and was characterized by ground-glass appearance [Figure 2]. There was obliteration of the left ethmoid sinuses with bulging into the left orbit producing some proptosis and local deformity of the eyeball and deviating the left optic nerve. The patient underwent left endoscopic sinus surgery and mass removed with the aid of curettage and drilling. During the histopathological examination of the material, it was observed that an irregular osseous trabeculae, which had no osteoblastic activity, dispersed inside the fibrous stroma [Figure 3]. The patient is clinically asymptomatic, is under follow-up every 6 months. 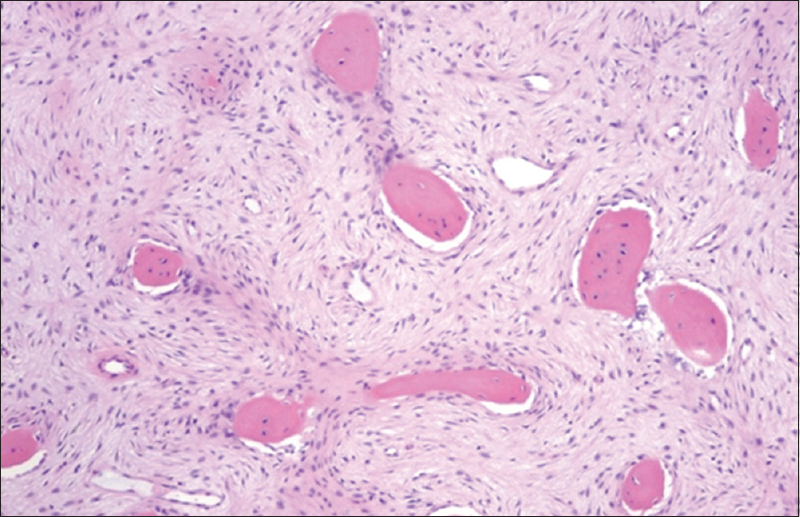 Fibrous dysplasia is a fibro-osseous lesion that is benign in nature, and the involvement of ethmoid bone is rarely reported. Monostotic fibrous dysplasia of the ethmoid sinus is one of the rarest lesions. It was originally described in 1938 by Lichtenstein. Monostotic and polyostotic forms are defined, depending on whether one or more bones are affected, which are noted in 30% and 70% of patients, respectively. The most common location for monostotic form of fibrous dysplasia are ribs, proximal femur, and craniofacial bones. Among the craniofacial localizations of fibrous dysplasia, the maxillozygomatic complex is most frequent affected. Ethmoid, sphenoid, temporal and frontal bones are rarely involved. Malignant transformation is rare (0.5%) and is usually seen only in polyostotic cases. The diagnosis of fibrous dysplasia is made on a combination of clinical, radiological, and pathological criteria. Radiologically, fibrous dysplasia presents as a fine, granular, homogenous, appearance, likened to that of a ground glass. Open surgical technique and endoscopic removal – both are commonly employed to remove the lesion. Fibrous dysplasia is of particular interest to the ophthalmologist because it can affect the craniofacial bones either as a monostotic fibrous dysplasia or as a part of polyostotic fibrous dysplasia which is sometimes associated with skin pigmentation and endocrine disorders and is known as Albright's syndrome. When the craniofacial bones are affected, encroachment on the paranasal sinuses, orbit, and foramina of the skull may lead to visual loss, proptosis, diplopia, and epiphora. In cases of fibrous dysplasia affecting the paranasal sinuses, the decrease of visual acuity is progressive, produced by bone proliferation and compression of the optic nerve. Differential diagnosis of fibrous dysplasia of ethmoid sinus should be considered in patients presenting before the age 30 with chronic retro-orbital pain. Feldman MD, Rao VM, Lowry LD, Kelly M. Fibrous dysplasia of the paranasal sinuses. Otolaryngol Head Neck Surg 1986;95:222-5. Katz BJ, Nerad JA. Ophthalmic manifestations of fibrous dysplasia: A disease of children and adults. Ophthalmology 1998;105:2207-15. Kransdorf MJ, Moser RP Jr., Gilkey FW. Fibrous dysplasia. Radiographics 1990;10:519-37. Osguthorpe JD, Gudeman SK. Orbital complications of fibrous dysplasia. Otolaryngol Head Neck Surg 1987;97:403-5. Bland LI, Marchese MJ, McDonald JV. Acute monocular blindness secondary to fibrous dysplasia of the skull: A case report. Ann Ophthalmol 1992;24:263-6. Van Rompaey D, Schmelzer B, Verstraete W, Cammaert T. Fibrous dysplasia in the frontoethmoidal complex: Diagnosis and surgical aspects. Acta Otorhinolaryngol Belg 1994;48:37-40.